Our Cocoa Beach fishing charters offer deep sea or Inshore fishing the saltwater lagoons. This area is one of the most diverse and productive fishing areas in the United States. There are hundreds of square miles of pristine waterways including the Indian River Lagoon. Coupled with the coastal waters, Port Canaveral deep sea fishing on the Atlantic is a big event. While this area is known for dreaming about Jeannie, in the center of it all is world-class surfing and the famous Ron Jon’s Surf Shop. Uniquely, Cocoa Beach is still a bedroom community with a laid-back atmosphere. Home to Eleven times world surfing champion, Cocoa Beach native, Kelly Slater. The surfing extraordinaire often returns home to relax and enjoy the coastal waters. Outdoor recreation provides kids to seniors with an opportunity to meet and build relationships with others. When venturing offshore with Captain Richard on one of his Cocoa Beach deep sea fishing charters, you’ll experience what a Cocoa Beach fishing charter has to offer. Using live bait to catch king mackerel. The same method most SKA (Southern Kingfish Association) tournaments pursue these spectacular species. You can find yourself catching mahi-mahi, sailfish, cobia and other Florida fish species off shipwrecks and reefs. Come on board our Cocoa Beach fishing charters for a fun time. It’s an exciting way to enjoy your vacation holiday in Central Florida. 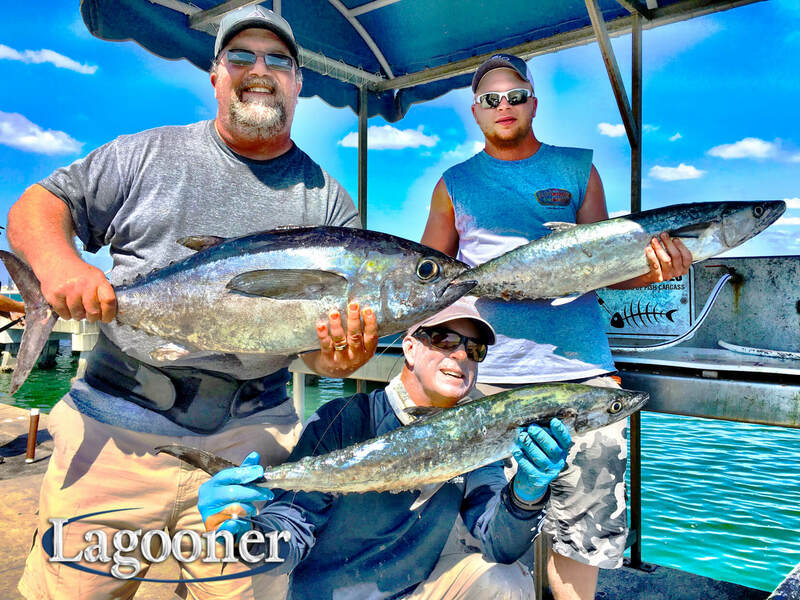 Lagooner, which is Captain Richard, offers anglers expertly guided inshore fishing charters. Touring the brackish waters around the Thousand Islands surrounding Cocoa Beach on a Banana River fishing adventure. Sight fish for world-class redfish and spotted sea trout. Fishing Cocoa Beach in the backcountry flats is a way of life here. To the west lies tens of thousands of acres of crystal clear grass flats. Teaming with large basking redfish waiting for that perfect fly presentation. Mangrove lined shorelines riddled with snook, tarpon, and spotted seatrout. Fish caught in these estuaries hold several world records. There is little doubt that you can find more today.